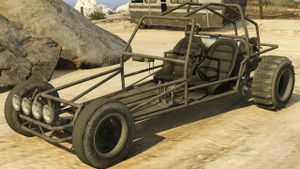 A Dune Buggy in GTA V.
The Bürgerfahrzeug Dune Buggy is a sand-driving buggy in Grand Theft Auto V.
Used in ground Arms Trafficking missions by Trevor Philips. Found at the start of both of Cletus' Strangers and Freaks encounters. Frequently spawns being driven in and around Sandy Shores. Sometimes spawns on a hilltop just west of the Yellow Jack Inn. Trevor Philips (after purchasing McKenzie Airfield in Grapeseed. Bandito, a similar vehicle appearing in Grand Theft Auto: San Andreas. BF Injection, another dune buggy. Dune, an off-road truck appearing in Grand Theft Auto: San Andreas. This page was last modified on 21 July 2014, at 19:36.